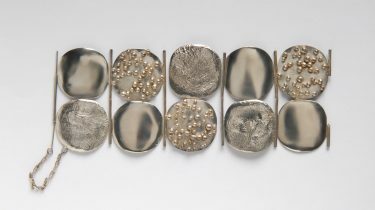 Helga Zahn worked in silver, an inexpensive material not regarded highly by the establishment, which she cut before working the surface. It was not only unusual and unconventional that she should use unpolished pebbles, but also that she mounted them using simple adhesive bonds. Later she would add the classic clasp and cabochon mountings. Her formal language is characterized by the clarity of simple geometric shapes – rectangles and circles, by the lightness and simplicity of her connecting elements – usually simple small rings – and by a palette that was initially limited to just a few colors, namely silver, black and brown. She created extraordinary one-off jewelry items, sometimes using found objects. At the same time, in the mid-1960s she revolutionized the globally emerging studio jewelry movement with an innovative system concept that envisaged the use of small cut panels. Mounting them on top of each other creates the impression of movement and transforms them into kinetic art. Delicate, accentuated lines and an expanded color palette in these works reflect the graphic work of Helga Zahn. Photographs of her pieces by the later famous fashion and product photographers Sidney Pizan and Tessa Grimshaw-Traeger also set totally new standards. Jewelry artist Helga Zahn quickly became “an important liberating force in Britain…” as Ralph Turner, co-founder of the jewelry gallery “Electrum” and later Head of Exhibitions at the Crafts Council, London, put it. To mark her 80th birthday the town of Schwarzenbach an der Saale, in cooperation with Die Neue Sammlung and on the initiative of the Dr. Hans Viessmann Foundation, is honoring this extraordinary and pioneering jewelry artist. 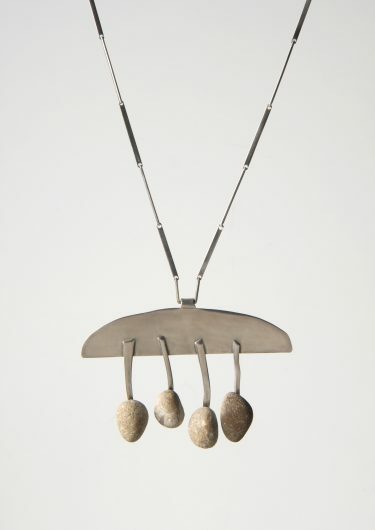 The exhibition on the lifework of the artist, who died in 1985 at the age of just 49, features around 80 jewelry objects and a selection of her silkscreen prints. Thanks go to the Christian-Heinrich-Sandler-Stiftung, die Danner-Stiftung München, den Kulturverein Schwarzenbach a. d. Saale e. V., die Oberfrankenstiftung und die Gemeinnützige Stiftung der Sparkasse Hochfranken and special thanks to the Dr. Hans Viessmann Foundation, Hof. The exhibition is accompanied by a catalog of 104 pages published by Arnoldsche Art Publishers, Stuttgart. Thursday, September 22, 2016, 11:00 a.m.